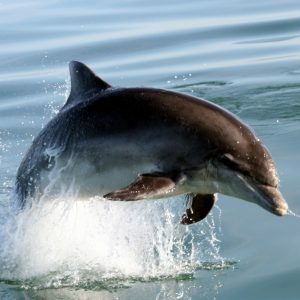 Dolphin comes from the Greek delphin and in fact the common dolphin’s latin name is Delphinus delphis. Porpoise derives from the Latin phrase porcus, which means hog and piscis meaning fish, literally meaning sea pig. The porpoise’s relationship to a pig is found in many names, for example, in South America it is known as chancho mariono which means sea pig and in Germany it is called meerschweinalso meaning sea pig. Do killer whales deserve their name? The name killer whale implies a deadly animal whose predatory behaviour is unique amongst the animal kingdom and should send fear tingling down one’s spine. 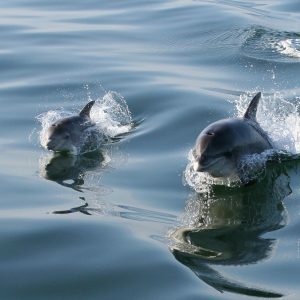 It is true that they are extremely efficient hunters and are able to take down a wide variety of other marine animals – not just fishes but also birds and mammals – sea lions, seals, porpoises and even large whales. However, it is very rare for them to attack humans (cases of this almost always involve captive animals). When capturing such prey, they use a mix of guile, speed and agility along with a lot of stamina and some massive teeth (which can grow up to 4 inches or 10 cm). 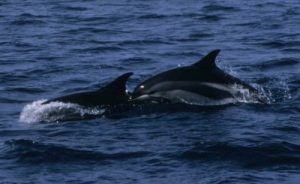 Although unusual for cetaceans, many other species will feed on other mammals, and so we may prefer to call the killer whale by its alternative name of orca. 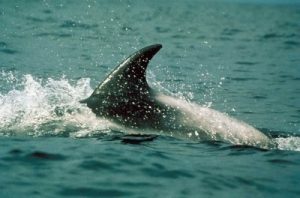 Why do some whales and dolphins have a dorsal fin? 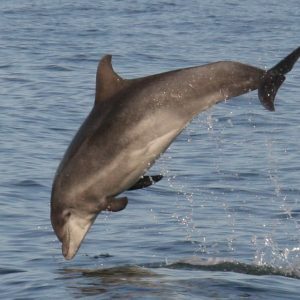 The dorsal or back fin stabilises the mammal in the same way as a keel on a sailboat stabilises a boat. Most whales and dolphins have a dorsal fin, but in some it has been reduced to just a series of bumps, such as in the sperm whale. In some it has been lost altogether such as in the beluga, narwhal and right whales. 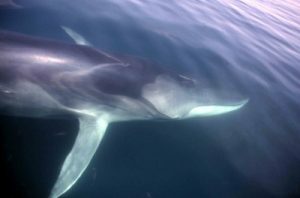 What are the differences between Baleen and Toothed Whales? Baleen whales don’t have teeth and toothed whales do! And the difference reflects a fundamental difference in feeding habits. Baleen whales tend to feed on small animals like plankton and toothed whales hunt and feed on individual prey. Another difference is that toothed whales use echolocation, mentioned in your “All about Dolphins” booklet, emitting high frequency bursts of sound that reflect back from their prey. There is no evidence of baleen whales using echolocation. If Baleen Whales don’t have teeth, what do they have instead? They have lines of bristles called baleen, formed from the same substance that makes fingernails and hair. These bristles are continuously worn away and then regenerated. The bristles enable the whale to trap the prey it takes into its mouth. The male narwhal does! A tusk is simply a long pointed tooth, which sticks out from a whale’s mouth even when it is closed. The male narwhal has one upper tusk which can be as long as 3 metres. How well do whales and dolphins see? Whales and dolphins have excellent vision, both in the water and in the air. 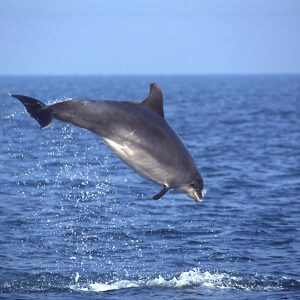 The only species of dolphins with reduced vision are the river dolphins found in the Amazon, Ganges and Indus rivers. Here the eye is simply a slit 2-3 mm in diameter. Sounding is a word used when whales and dolphins dive down deeply into the water, usually to look for food. Breaching is when whales and dolphins launch their bodies out of the water almost vertically. They then descend onto their backs with a huge crash. Humpbacks will breach during courtship, in the winter months. How deep can whales and dolphins dive? Most whales and dolphins spend most of their time swimming in 100 metres of water because this is where food is most plentiful. Scientific studies have shown, however, that sperm whales can dive as deeply as 1,185 metres, whilst a bottlenose whale dived to an incredible depth of 1,453 metres off the coast of Nova Scotia. Bottlenose whales can hold their breath for up to 2 hours! 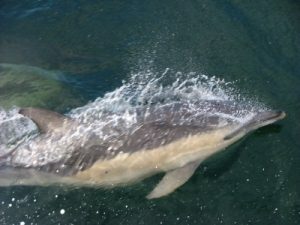 A captive bottlenose dolphin was trained by the US Navy to dive as deeply as 535 meters. A blow is an outward breath of a whale or dolphin and is explosive! Sometimes the species can be identified by their blows. Often the blows are 5-6 metres high and are visible for several miles. An experienced observer can estimate the size of the individual by the height of the blow. Baleen whales produces a double blow, because they have two nostrils instead of one, although the double blow often merges into one single plume, as in the humpback whale. When a blue whale exhales, the spray from its blowhole can reach nearly 30 ft (9m) into the air. Whales and dolphins do not sleep in the same way that we do and the reason for this is that when they sleep they stop breathing. So they can only sleep or doze for short periods. Some whales doze just under the surface of the water, rising up just enough to take a breath. Sometimes ships run over whales ‘sleeping’ in the shipping lanes. However, they can also go into a semi-sleep mode where one half of the brain switches off but they continue to surface for breaths. How do Whales and Dolphins make sounds? This isn’t an easy question to answer, because whales and dolphins don’t have vocal cords like humans do. 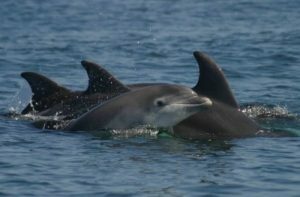 In dolphins the low frequency whistle sounds they make are thought to be produced by their larynges, and the high-pitched clicks by the complex structure in their foreheads. The sounds that humpback whales make are known as whale songs. Whale songs like bird song serve as a means of communication. Only male humpbacks actually sing and it is one of the best ways to advertise for a mate! 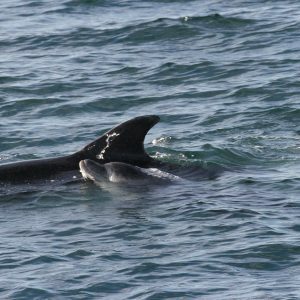 Recent studies carried out with the bottlenose dolphins in Cardigan Bay in West Wales have shown that they have their own accent and that their whistle is slightly different from other dolphins from western Ireland, for example! How do Dolphins keep warm? Dolphins have a layer of blubber under their skin which keeps them warm. They also have less of their body mass exposed to the outside, which means they cool more slowly. They are also able to ‘pump out’ metabolic body heat faster than we can. Their bodies are very clever because they can change the flow of blood, so that it stays within the body, and not flowing into their outer body parts e.g. tail (fluke) and fins.